**Mousou Mapping Tote bag/ Kitten in the bag** What if there was a hamster hiding in your bag? Using the method of trick art, we expressed that fantasy with our original Mousou Mapping technology. 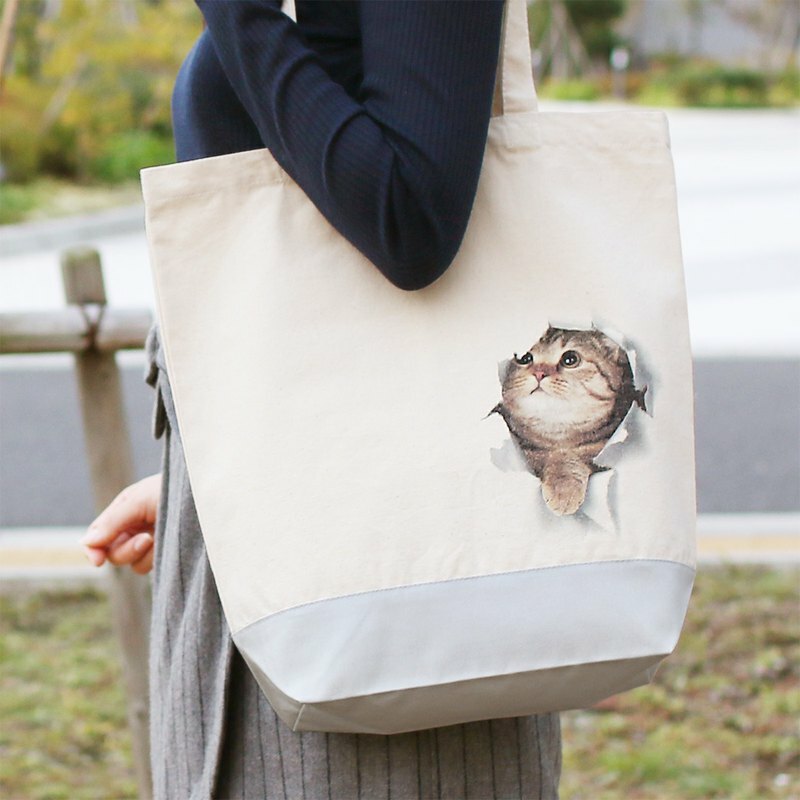 From the Mousou Mapping collection, this is a tote bag with a printed kitten peeking out from the tear. **The concept of "Mousou Mapping"** Mousou(=delusion) Mapping embodies people's fantasy with it's own technology. How will people react when the world the inside their heads are laid bare before their eyes? The time when our imaginings can be kept private in our minds has long passed. So, everyone don a mousou mapping items and jump into a new world of ambitious dreams! **Specifications** Material: Cotton 100% Designed by ekoD Works in Japan/ Made in China/ Printed and Assembled in Japan **HANDLING AND MAINTENANCE PRECAUTIONS** -This product can't be washed. -If it gets dirty, wipe it gently with a wet cloth. **<Shipping Information>** -After receiving your payment, we will ship the product within 3 days. -Delivery operator: International ePacket -Tracking number will be provided. -Estimated delivery time: 7-15 business days. -We are not responsible for a late or lost package after shipping out our company. **<Return/Exchange Guidance>** -Buyers may return an order and request for a refund, partially or in full, within 7 days counting from the day after the order arrives at the recipient’s address. -Buyers are responsible for all shipping fee including the shipping fees of returns. -Returns Policy https://en.pinkoi.com/policy#~g -Refund Requests https://en.pinkoi.com/my/refund **<Disclaimer>** -The color of our images may be effected by customor's system environment, and there may be differences between the actual products. -Some photos of this shop are for illustrative purposes only. The actual product may vary. -With typographical errors, some items mentioned may be changed without notification. -Without notification, there are cases when we have changes in product specification, prices, and other information. -The products are manufactured under Japanese conditions of law and safety standards. -Please be responsible to make sure if there's no problem in any other countries with different laws and standards.